One of the first saltwater fish I caught when I was kid was a flounder. Ever since then, I’ve been infatuated with the flat fish. I used to fish for flounder the old school way: drift the passes with Carolina-rigged bull minnows or finger mullet dragged along the bottom. We caught a few flatties that way, but the effort that went into it was pretty extensive for the results. First, live bait had to be caught and kept alive. Then it was out to the pass to play drifting do-si-do with a dozen other boats doing the same thing. When we finally caught one, we really never knew exactly where it came from because by the time we got it in the boat we had drifted 100 yards. At times, I felt we were just “floundering” around for flounder. In the last decade there have been two lethal angling technologies that have improved my flounder fishing 10 fold: the advent of side-imaging technology and Berkley Gulp. 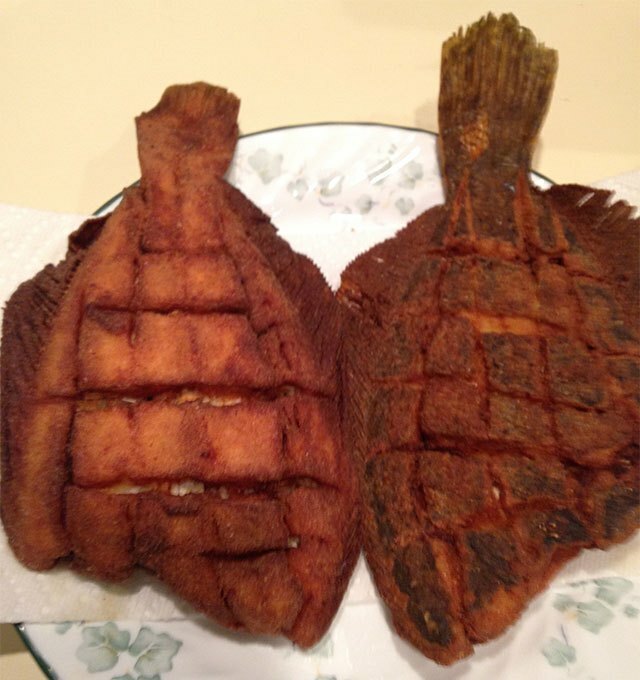 By combining the attributes of these two innovations, catching flounder has become a far more efficient process. The fish-finding electronics of today are worlds beyond what was available 10 years ago. Not only are today’s electronics pinpoint accurate with GPS positioning, their modern ability to “side-scan” with Side Imaging or StructureScan technology as well as Down Imaging or DownScan with a 3-D view of the bottom is astounding. What’s more, these units are far more affordable than what they were 10 years ago. When I first tell people I find schools of flounder with my Humminbird Side Imaging unit, they think I’m claiming that I see the actual flounder on the bottom. So, to be clear, I am not claiming to see flounder on the bottom with Side Imaging. What I am claiming to see on Side Imaging are small pieces of junk on the bottom where flounder like to lay to ambush prey. Since I first got my hands on a Humminbird 997 back in 2010, I have spent hundreds of hours mining up little pieces of structure on the bottom of bays and inlets along the Panhandle Coast of Florida. If I can find any little something sticking up off the bottom in 10 to 50 feet of water anywhere near an inlet, pass or even just a primary tidal creek, it usually has a flounder – or several – on it. The “little something” does not have to be very big, either. Some of the best items I have found are what look to be sunken johnboats, old buoy/boat moorings, wayward rocks that got displaced from the jetties or even clumps of oysters in the middle of a tidal creek. Anywhere a bridge spans over a bay is great place to look for obscure stuff that fell into the water during construction. Bridges are also choke points that produce a more current as well. Another thing I’ve developed an eye for on Side-Imaging is a rough spot on the bottom. After hours of looking at bright, barren, rippled sand on an imaging machine, rough spots jump out as being a little darker and grainier and a foot or two higher on top – almost like a small hump. The key combination is current and a single object or rough spot on a barren bottom in 10 to as deep as 50 feet – this is flounder heaven. The second “technology” that has kept me from floundering when floundering is Gulp. I use the word “technology” here because Gulp is essentially a lure made of a proprietary material designed to disperse a scent into the water and flounder are one of the many species of fish that absolutely go nuts for it. I used to be a live-bait die-hard for flounder, but Gulp has allowed me to leave my cast net at home. My favorite Gulp shape for flounder is the 3-inch shrimp. But I have also caught plenty of flounder on the Mud Minnow and Jerk Shad. Honestly, I don’t think the body shape matters that much, it’s the deadly scent wafting on the tidal currents that trips their trigger. The trick to putting flounder in the boat is to get the Gulp right to the object or structure that’s breaking the current. And this is where the modern-day advancements of new electronics are so amazing. As you are side-scanning, most units allow you to scroll the cursor out to the exact location of an object you have detected on the bottom and mark it precisely with a waypoint. Now you can return to that exact piece of structure, cast up current of it, and “drift” the Gulp down to and passed it. As for rigging the Gulp, I simply thread it on a jighead. If I’m in 10 to 20 feet of water, a ½- to ¾-ounce head works fine. Beyond 25 feet, I go with a 1-ounce head. Again, the goal is to sort of drag, or almost drift, the Gulp jig along the bottom to the object naturally. For this reason, I am a fan of braid (15- to 20-pound test) tied to a long (6-foot) fluorocarbon leader of about 15-pound test. Conventional inshore spinning tackle in the 7-foot, medium-heavy action range is fine for this type of fishing. 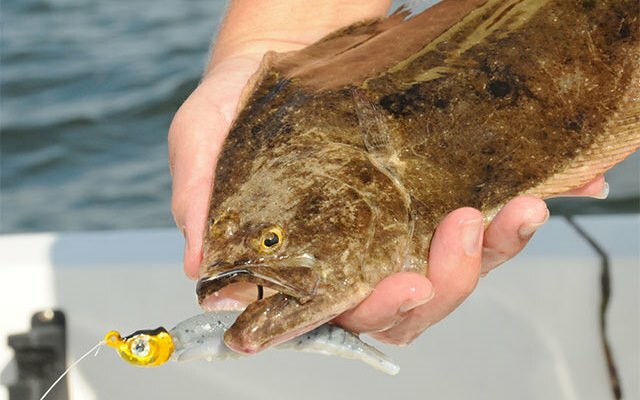 Flounder bites are pretty subtle – your line will just get tight – almost like you’re hung up. There will hardly be any detectable movement from the fish. Just set the hook and start reeling. As a side note, I’m not usually a landing net guy, but when I’m fishing for flounder, I always bring a net. Flounder have a rather vicious flapping maneuver they perform at the side of the boat that allows them to free themselves from a hook rather easily. Plus, I’m not going to lie, flounder are a valuable commodity at our dinner table, so we like to stack the odds in our favor. Speaking of which, our favorite way to prepare flounder is to simply removed the head, gut it and then fry it whole, often referred to as “crispy-scored flounder.” Smaller, 13- to 14-inch keepers are perfect for this type of frying. Once they get to 16 inches or beyond, it’s best to fillet them on out for some delicious frying or baking.